Online resources on radioactivity and gamma radiation at the LHC are primarily concerned with leaking protons, ones that escape the beam and hit various parts of the accelerator complex. Those protons activate the nuclei they hit, making them radioactive. See, e.g., "Taking a closer look at LHC - Ionizing radiation". A different radiation safety issue at the LHC, or any modern particle accelerator, is the gamma radiation produced intentionally as part of the normal physics operation of the accelerator, that is, the gamma photons produced from the annihilation of the colliding particles. If the two colliding protons at the LHC turned into two photons, each would have a photon energy of 6.5 TeV and a frequency of 1.57 × 1027 Hz. The two initial protons rarely annihilate into two photons; yet, even an annihilation product, for example the Higgs boson, can decay into two gamma photons, each with an energy of 63 GeV and 1.52 × 1025 Hz frequency. Such gamma rays are produced millions of times per second during normal LHC operation. These exceptionally hard gamma rays are five orders of magnitude more energetic than the highest-energy nuclear decay gamma radiation, which itself is highly dangerous to biological systems. Under these circumstances, what safety measures can be enacted? What is a good summary of the protection against this type of radiation? What you are talking about is called "prompt radiation" (that is, it happens as an immediate consequence of the beam being on). The main things you do about it are bury the accelerator (meters of rammed earth make a very good radiation shield) and not allow human beings to be in the tunnel, the experimental halls and nearby areas while the beam is on (or for a few minutes afterward). Toward that end all the entrances to those areas are instrumented and designed to stop the beam if someone tried to access the secured area; these are called "interlocks". Obviously it also alerts the operators. Interlocks are made as simple and foolproof as possible. To take and example from a household appliance the lid interlock on my washing machine is a simple switch that must be closed for current to get to the motor: the computer doesn't know anything about it, so a programming error can't affect it. And it fails safe: if the switch breaks the power is off, not on. The same basic requirements are used for the beam interlocks at accelerators. To this is added scheme to allow temporary access without dismantling the whole protection scheme. For instance accesses are made through two-door locks, and you can't open the inner door while the accelerator is enabled nor the open outer door unless the accelerator is enabled (the interlocks are reversed). You take a key out of a special interlock panel in the lock to disable the accelerator and enable the inner door. Basic rule: your access key is your life—while it is in your pocket they can't (not don't have permission, but actually can't) turn the beam back on—so keep it with you at all times during an access. The 'can't open the outer door until the accelerator is re-enabled' aspect of the scheme makes sure that you leave with all the people you went in with. There are, of course, layers of administrative protections above the hardware layer. Sweeps of the enclosure before locking up, sweeps of the area to be accessed with radiation monitors on poles at the start of an access, remote operated cameras in a position to see all parts of the secure area, individual sign-in and sign-out during accesses and so on. But the core protections are shielding the whole site and keeping people away from it while the danger is present. If the two colliding protons at the LHC turned into two photons, each would have a photon energy of 6.5 TeV and a frequency of 1.57 × 1027 Hz. Not so much worry about the planned reactions, they are completely contained by the detectors. They are the electromagnetic calorimeter, the hadronic calorimeter and the muon detector. It is long term that problems of irradiated detectors will appeaer. An illustration of the CMS detetor. The electromagnetic is designed to measure gamma energies and electrons, the hadronic sums up all the strongly interacting energies of the particles/jets. Only the muons survive and there are meters and meters of iron and absorbers so as to measure them. Very few may get out, and they are weakly interacting in any case. We are continuously bombarded by cosmic muons after all. 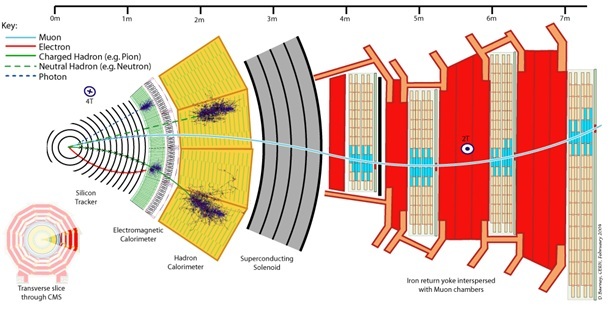 Study of long time accumulation of radiation on the CMS detector detector components have been the result of a thesis, so people are aware and taking care of not exceeding limits by having a group responsible for the radiation hazards around the detector. Not the answer you're looking for? Browse other questions tagged radioactivity large-hadron-collider gamma-rays accelerator-physics photon-emission or ask your own question. What exactly is the difference between a sychrotron light source and a free electron laser? Earth still exists - does this fact tell us anything about LHC safety? Can spin polarisation restrict the possible types of LHC proton-proton collisions? In the LHC, how is the proton separated from the electron in the hydrogen? Is accelerating charges only way to produce EM radiation? What about gamma from nucleus? Can gamma radiation cause elements to become radioactive?